The Kamila Rose, a bright orange or Coral Rose, is the perfect bud for your graduate's reception party; a floret that is a symbol of pride, beauty, and love. These beautiful blossoms are also well suited for bright color weddings, exciting birthday parties, and any event where someone has achieved a great accomplishment. Bringing life into any event, it has an elegant color and striking beauty. As a centerpiece, they are a wise choice with their unique color and radiance, they will be a sure fire winner with your guests. As a corsage it will add color and elegance to any woman's attire for proms and black tie events. Our greenhouses are state of the art and we use only the most current techniques to reliably provide our customers' with the best Coral Rose floras Mother Nature can produced. Our facilities are located in Colombia, where we can provide our flowers with all year round sunshine. We also adhere to some of the strictest environmental standards in the industry. We love our products and their natural beauty. We believe every effort should be made to make sure nature continues to offer her beauty to all of USA. We ship exclusively with FedEx to provide excellent service and reliability. Also, shipping is free for those who order within the continental USA. 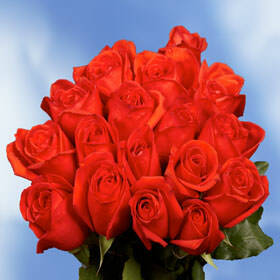 Your orders will arrive to you not bloomed and will need up to two to three days to open.